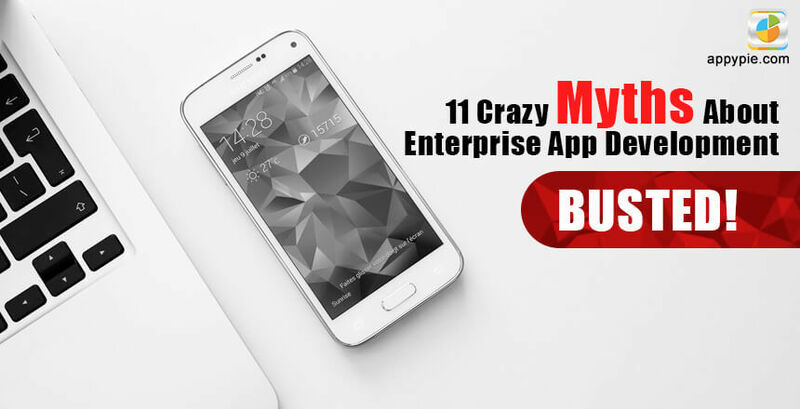 11 Crazy Myths About Enterprise App Development – BUSTED! 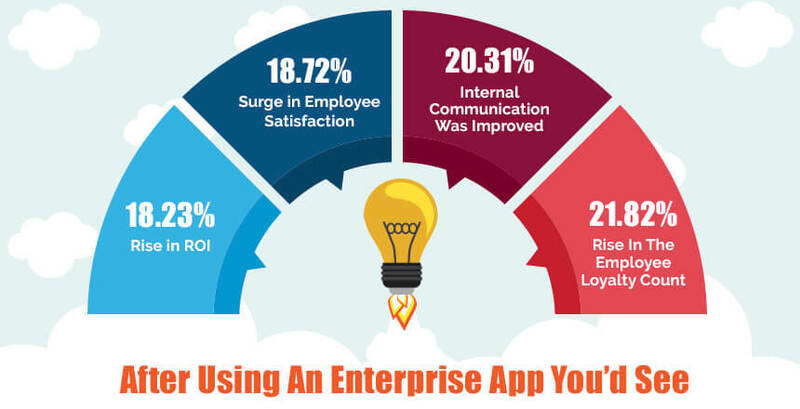 App Builder Appy Pie: In this post we are going to talk about the reasons why you should have an enterprise app for your organization, what you can expect from this investment, and most importantly we are going to bust some of the biggest myths that have been doing rounds, stopping you from taking the leap! The world has already gone mobile and there is an app for everything today. Consumers have taken to using mobile apps for everything and are adopting it as one of the most convenient mediums to accomplish a variety of tasks. It is natural that businesses have to think of an effective mobile strategy that extends beyond a single mobile app and a website for their business. In this environment as the businesses are rapidly moving to the mobile platform and enterprise mobile apps can in fact offer the most suited and the easiest solution to the most complex issues that can emerge in any business. Why should you or anyone else invest in Enterprise Mobility Solution? Enterprise applications have contributed in a big way to shaping the corporate world as it is today, and the businesses are quickly realizing their potential. Let’s take a quick look at the reasons why any business that aims to succeed must invest in Enterprise Mobility Solutions. It is common for the smaller businesses to be a little hesitant about jumping in on this particular bandwagon and it is mostly because of certain myths that are doing rounds for some time now. As a veteran in the industry I have seen many businesses drag their feet on this, and it is frustrating to see the kind of damage these myths bring about for them. Now, it is time to bust some serious myths! This is one of the biggest myths that are taken to be true when it comes to building enterprise apps. Mobile apps are not just for the millennials anymore, they are more inclusive and many of them are even suitable for a 5 year old while still others can easily be used by an 80 year old. 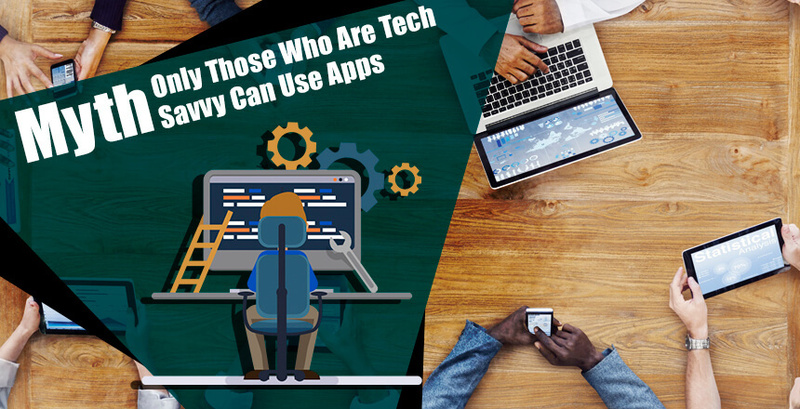 Enterprise apps can be developed particularly in a manner that would make sure that people from all demographics, inclinations and computer literacy can easily make use of it, leveraging its full functionality. It is obvious that in any organization or business, there would be a great number of people who are all different from each other in their technical proficiency, inclinations, or even in the manner they are going to be using it. Typically, the businesses that are looking to develop an enterprise app are doing so to make complicated processes simpler. A business consists of a lot of people who have their jobs and responsibilities assigned to them. It is these people at various levels who would be the end users eventually. To believe that these users need only be involved in the app building process at the end of the whole process would land you in trouble, inevitably! It is important that you keep all these end users in the loop all through the process. Quite like any other mobile app, it is after all the app users who are the most important. Once you discuss with the end users, their expectations from the app, the chances of the app being a success are a lot higher. On top of that, all through the process, the app users should be aware of all the features and functionalities that you are going to add to the app and the user journey through the app. This will help you gauge their comfort in using the app as well. It is common for companies that have dedicated IT divisions to think that they can manage the whole development process in-house. Now, they might be great at the conceptualization and even the visualization part of the whole process, which can help them wireframe the whole app in an effective manner but that does not mean they would be able to handle all the aspects of the project. The enterprise app development process and its implementation come with its own complexities and challenges that can prove to be beyond the scope of a typical enterprise. Enterprise app development might involve extraction of important data from any existing applications in a suitable manner, add to it the dearth of skills and experience specific to mobile app development and the existing responsibilities and it might all be an uphill task even for some of the best organizations. This is why, it makes sense to look outside of the organization and hire experts because extracting the right data in a suitable manner can be instrumental in the quality of the final outcome. As you go about looking for experts to hire for your enterprise app development, there would be many who would come up with new age terms like “agile” and “rapid development” when they are talking about their development cycle. You would even come across claims where they completed the whole process of development in a surprising 9 weeks or a ridiculous 6 weeks of time. Now, as an enterprise, when you set about with these promises in mind, chances are you are going to be surprised to learn that 6 weeks in development are different from 6 weeks in your dictionary. The development time clock generally starts only after you have already extracted the information that you need from SAP, Oracle, Slack, Salesforce, Todoist, Dropbox, or any other app that you are bringing together. The whole process of data extraction in the desired and usable form can take anywhere between 8 to 12 weeks! This means you are late, even before their clock has started! This myth stems from the misplaced belief that your enterprise app is going to serve as a mini version of the enterprise website you already have in place. It is important to understand that the reason why you are making an app is because you want to simplify a certain aspect of the process and only offer focused functionality to the targeted users. Enterprise apps that are stuffed to the hilt with numerous features end up becoming slow, bloated, and might eat away into a lot of memory. Making the app look great might not even be important for the users you are targeting, because more often than not, they are looking for ease of use when they are trying to accomplish any task! Your focus needs to be on making the user experience really smooth and easy, even as you are addressing only specific functionalities and features. There is no ‘one size fits all’ price tag for developing enterprise apps. The cost incurred depends heavily on the business requirement. 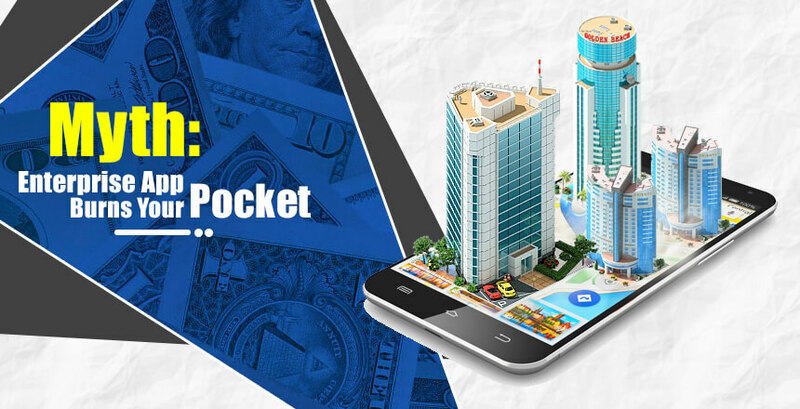 There are multiple factors that contribute to the cost of developing the app/a>, and unless you actually set out to explore the options and get some quotes, it would be unwise to simply assume that it is beyond your pocket to get an app. Finally, the cost of building your enterprise app would depend heavily on the complexity of your requirements and the features that you would need to add to your enterprise application. It is commonly believed that developing a successful enterprise mobile app depends only on coding and that is it. In fact there is a lot more to the story. Coding is only the basic requirement, but to design an entire app, you would, of course need a concept or an original idea, functionality design, graphics, and user experience, all of which needs a certain experience and expertise. This myth is kind of based on a fact which was true a long time ago. 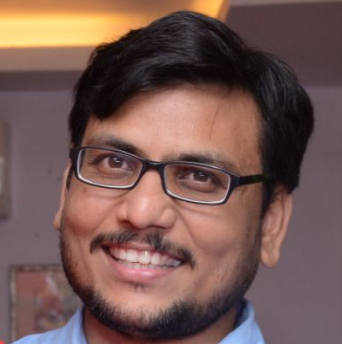 It is true that there really was a time when the mobile apps needed dedicated APIs to be able to access the backend systems like Oracle, SAP, MySQL etc. Today, however, things have changed drastically due to the availability of mobile backend as a service to match the standards of enterprises. It is for this reason that apps can view and integrate with the Legacy Systems. This alleviates a lot of trepidations about the use of APIs and the related infrastructure requirements that were needed earlier. This is a fast-paced world, and the businesses of this day and age certainly need a robust mobility strategy to survive and flourish. In this day and age, a company that thinks an enterprise mobility solution is unimportant might not be paying attention to the importance of revolutions like CORP & BOYD which seem like more than a mere trend, it in fact is going to settle as a standard norm soon. It is less of an option and more of a medium to enhance the overall productivity of the organization and the employees. Failing to acknowledge the inherent benefits of implementing enterprise level mobility solution can prove to be an obstacle when it comes to guiding the business on to a path of success while preventing you from gaining a competitive edge. This is yet again a myth steeped back in history. There was a time when keeping any data on a mobile app would equal the act of opening the data up to hackers with malintent. 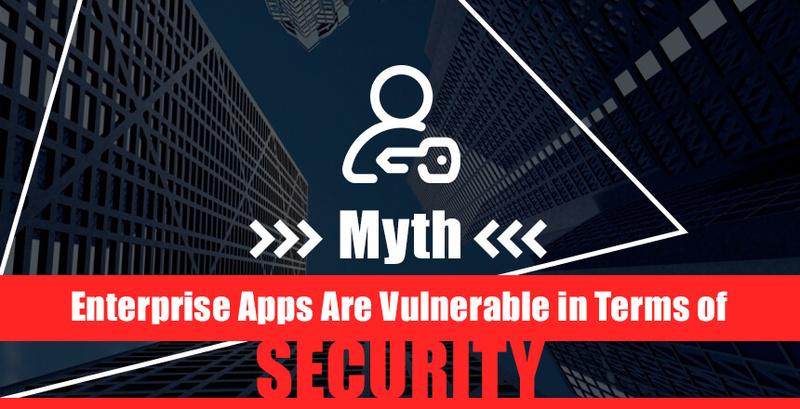 The mobile app development companies today incorporate sophisticated security measures making them virtually immune to any hacking efforts. The big players of enterprise app development world are now leveraging disruptive technologies like Blockchain to build apps that would be impossible to hack or broken into without alerting the right people. For a good number of years now, the world of enterprise mobility has advanced at an impressive rate. There are new solutions coming up almost every month and there has been speculation about a scenario where there would be a few winners emerging out of the whole scenario and a general standardization would eventually be implemented. If you ask me, that is not going to happen anytime soon. The reason for my belief is that even the standards like HTML5 and OAuth are evolving. Applications like SAP, Oracle, and Salesforce that form the foundation are evolving as well. And, the solutions that the enterprise app vendors are coming up with are also undergoing a ridiculous amount of change at an alarming rate! Hence, consider change your friend in this isolated scenario! If you make provisions for change and leave some room for flexibility, you are setting yourself up for a future you would be happy to see where you would be able to harness agile and lean methodologies to build unique mobile solutions. Some of these myths are baseless, while still others are simply information that is irrelevant and outdated. Believing in any of these myths can not only prevent businesses from leveraging their potential but also sometimes damage their entire endeavor of developing apps for their business (were they to begin with misplaced beliefs).